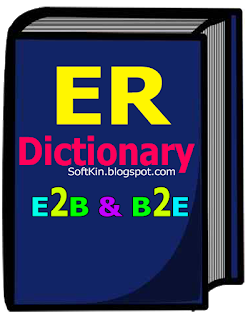 ER (English to Bangla and Bangla to English) Dictionary is a Unicode Based Digital Bangla Dictionary for New Generation.It Can Helps You to Find Any English Word Bangla Meaning or Translation and Any Bangla Word English Translation.You Can Easily Use this Dictionary E2B and B2E. Electric Rain Dictionary: ER Dictionary Made for Educational Purpose this is a Powerful English to Bangla and Bangla to English Translator Dictionary.You Can Easily Translate Any English Word to Bangla and Any Bangla Word to English.Basically A Dictionary Helps us in Many Ways Like, It Increase our Knowledge, It Helps us to Understood Another Languages, Translate Any Language, Learn Other Language, To Find The Right Meaning of a Word, To Find Synonyms or Antonyms of a Word.If you want to Learn English you can Use ER (English to Bangla) Dictionary and (Bangla to English) Dictionary.So you can Download and use the ER Dictionary, (English to Bengali Dictionary) (Bengali to English Dictionary provides you digital vocabulary base on English and Bengali word. Before Using this you must install .NET 2.0. A download link is given with the package.Download and Install the Electric Rain Dictionary on Your Computer and Enjoy It. Education and knowledge full easily. English All Kind of Word Translate. All Essential Educational word and vocabulary. Bengali to English All Kind of Word Translate. Memory ﴾RAM﴿: 256 MB or Up. Hard Disk Space (HDD): 20MB of free space required. ER English to Bengali Dictionary (version ) is available for download from our website. Just click the Download button above to start Downlaod. 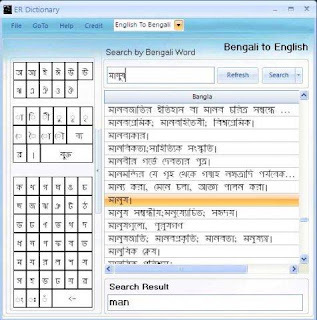 Download ER English to Bangla & Bangla to English Dictionary for Windows Xp/7/8/10 Offline installer for 32-bit and 64-bit. How to Install ER Dictionary?